Learning a new thing. I’ve never bounced a basketball before. I never thought about it being a sport for me. I watched my daughter in high school. I was proud of her as the captain of the team and point guard, but never felt a desire to do it. But, I am learning a new thing. The life lessons is that it is good for us to learn a new thing, to stretch ourselves, to get out of a comfort zone, to explore, and to learn new life lessons. We are never too old to learn. Challenges and obstacles. I’m short –5 ft and ½ inch (that half inch is important to me)! And because of that, my height makes it more challenging to play basketball. There are short ones, though, that are good ones. They have to do more and do it differently. They have to treat the obstacle as a challenge to be overcome. That’s a reality. My daughter, Raebekkah, was also one of the shortest players on team. She took it as a challenge to be overcome. She was faster than her teammates; she had the most steals, fast break points, and lay-ups. The life lesson is not to let a challenge become an obstacle. In America, race and gender and class are realities. As a Black woman, my journey is more challenging. It doesn’t mean I can’t succeed. It means I must be aware of those challenges and make appropriate adjustments. Often, those adjustments mean more work, but more work results in more excellence. We can’t let the challenge keep us off the field of life and out of the game. The challenge is to overcome the obstacle. Rules matter. When I first got on the court, I was a bit overwhelmed by all the lines! Obviously, basketball courts in gyms are multipurpose places, and other games can be played on them, but goodness, all the lines. 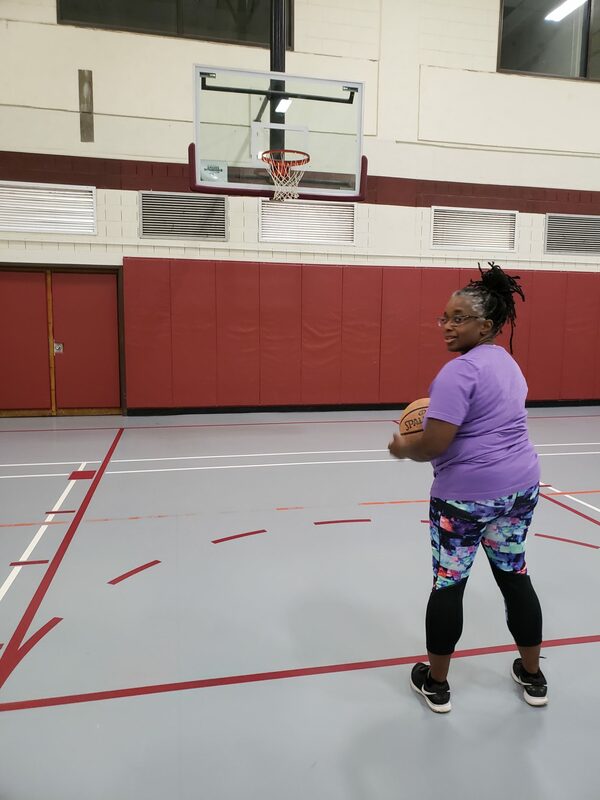 I learned which lines matter – three point line, the free throw line, the out of bounds line. I learned about travelling and double dribble. Lines, boundaries, and rules matter. You have to know them to know how to play within. The same in life. Rules and boundaries matter. In order to be effective, you need to master the rules, and also learn how to be a master within the confines of them. Technique matters. There are skills to be learned in any new adventure. The right technique makes a difference. It doesn’t mean that bad technique can’t result in good outcomes. When I first started, I was tossing the ball all kinds of ways to get it in the basket. Raebekkah came to visit and she was appalled at my shooting form. She made me do some drills and showed me how you put your hand under the ball to shoot. I liked that. I liked knowing that there was a technique to learn. In tennis, I’m a form snob. I notice those who don’t have good form. They can still be good, but for me, form matters. Look good at what you are doing. In life, it is important to master the technique of your profession. There are techniques in life — ways of doing a thing that can make a difference. Learn them, even if you want to do them differently. Practice matters. I’ve been practicing a few mornings a week. Often alone; sometimes with another. I believe I’m getting better, slowly. In life, doing a thing with an intentionality to learn, a passion, and a desire for excellence, makes a difference. I remember practicing music, learning a new piece, developing mastery, memorizing it, making it my own, and the satisfaction of seeing growth and improvement. Practice matters. Having a Coach. When Raebekkah showed up, she was my coach for a day. In high school she played point guard – essentially the coach on the floor – directing the offense, being a guide, providing directions. Coaches make a difference. Coaches in life matter; they can show us the way, provide directions, guidance, and encouragement. They have special knowledge from their own experience that they can dispense to make the path easier. My mom had a coach – Ira Henry. Ms. Henry was her high school teacher who saw the potential in a poor dark-skinned girl, and paved the way for her out of poverty and into college. We need coaches; we need more of us to help coach others. Concentration. Basketball, like a lot of life, requires concentration. You just can’t hurl the ball up. You have to focus on dribbling, on shooting, on aiming at the rim, or backboard. You have to focus. You have to concentrate. It’s a life lesson. Dedicated attention makes a difference. When your mind wanders, it is harder. Concentrate, focus, and see results. Coordination. Basketball is a game of coordination. You have be able to run, dribble, and shoot. The first time I did my full court lay-up, I over-ran the basket. Oops. When I tried to do some fancy behind my back dribble, the ball flew away from me. I had to be more coordinated. The life lesson is that we have to coordinate many things. We live in a world that rarely affords us the luxury of a singular focus. We have to multi-task and figure out how to do many things, often at the same time, and we have to do them well. Individual and Teams. I’ve been a team of one – practicing on my own. I can see, though, the fun and value of a team. You got some else to pass the ball to, to talk to, to cheer, to celebrate. I like teams. At Virginia Tech, I am part of two amazing teams in Inclusion and Diversity and Strategic Affairs. Really incredible people working together to accomplish shared goals. There is value in being part of a team. There is also value in being an individual. Teams cannot be productive and accomplish goals unless each individual on the team is committed, aligned, dedicated, and working at their potential. Teams need individuals and individuals need teams. Being guarded. I was playing by myself, unguarded. Creating drills, practicing full court lay-ups, pretending I got the rebound, creating commentary. No one was in my way. I liked that. And then, one day I had an opponent. He wanted to play 21 (again, I didn’t know the rules) and he was guarding me. Big tall arms of a 5’11 person standing over me – me, barely 5’1. How am I ever supposed to shoot? I told him guarding wasn’t fair. Put those arms down. This ain’t no competition. The lesson: Sometimes in life we are guarded; guarded by opposition; arms up; a barrier. And we have to find a way around the barriers. We have to shift. Do something different –a spin move, be quicker; be smarter. While I didn’t like and don’t like being guarded, I appreciate the value of the lesson. Raebekkah reminded me that it is how the game is played: you are guarded! Regardless, he still needs to keep his hands down or I’m going to have to double dribble to get around him! Being on the sideline and being in the game. I watched almost every home basketball game Raebekkah played in high school. I watch men and women’s basketball games at Virginia Tech, and I watch professional games on TV. Until now, I’ve been a spectator, judging, commenting, criticizing, having never played the game. Now, that I’ve moved – figuratively — from the sideline to center court. I sit at a different lens – a different view. I feel more humble now, less critical of others – even the big men when they miss dunks! It’s a good lesson to learn. It’s important to give others grace, be forgiving, be gentle, and be kind. It’s important to just recognize when we are on the sideline and how to be supportive and when we are in the game.